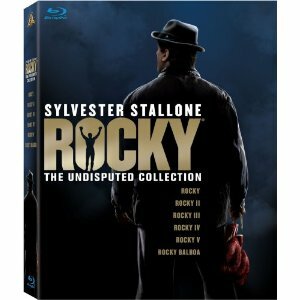 WorldMovieStore - Rocky The Undisputed Collection Sinopsis. The sixth installment of the Rocky series picks up the story of the Italian Stallion 16 years after the morose Rocky V. And sure, at his advanced age, Sylvester Stallone now looks like one of those sides of beef his character used to pound on. No matter. Somehow you buy the premise after all these years, even if it takes forever for Rocky Balboa to stop wallowing in self-pity (Adrian is dead, his old haunts are demolished) and get down to the business of drinking raw eggs and running up staircases. The business at hand is an unlikely exhibition fight with champion Mason Dixon (Antonio Tarver), which the near-sexagenarian Mr. Balboa has no business accepting. Of course, just as sure as the horns of Bill Conti's theme music are even now trumpeting through your head, the ol' Rock might have a punch or two left in him. Stallone wrote and directed, and there isn't much to say except that the movie steps in its pre-determined paces with a canny sense of what has come before (it's practically an homage to all the previous Rocky pictures, complete with fleeting flashbacks). Burt Young is around again, and Geraldine Hughes makes an appealing, rather chaste female companion for Rocky. Stallone's Rocky has gotten suspiciously articulate over the years, but he still knows how to slouch. If Stallone never forgets that, he can probably keep the franchise rolling. --Robert Horton. Read More Sinopsis. 0 Response to "New Release Rocky: The Undisputed Collection Blu-ray"